Violations and cover-ups in college athletics investigated by the National Collegiate Athletic Association (NCAA) are beginning to rival the headlines that the Securities and Exchange Commission (SEC) receives for investigations of corporate malfeasance. 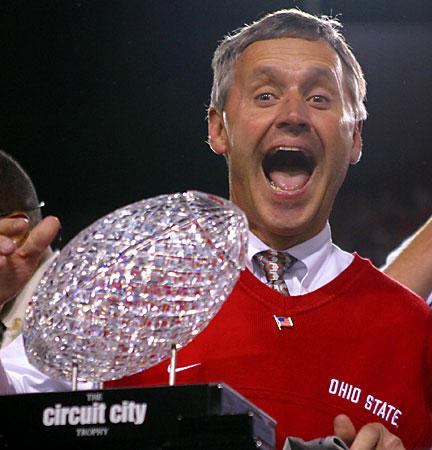 Former Ohio State University football coach Jim Tressel. December 2007. At the heart of both types of investigations is the question of how leadership perceives and executes its role in creating a culture — and what that culture says about how things are actually done around there. Unfortunately, as happens all too often in business, the push for short-term results, measured here by the cash cow of college athletics, too easily can obscure ethical considerations. University presidents, in their role as institution leaders as well as directors of the NCAA, are doubly accountable for making real a commitment to “integrity,” a word the NCAA espouses as one of its core values. However, all too many examples suggest the word has lost meaning when applied to college athletics. Complicating the issue of an athlete’s or coach’s behavior and a university’s own capacity to enforce a code of conduct are NCAA rules and the question of whether, as a governing body, the organization can adequately address ethics and enforce consistent compliance. While much has been and will be written about problems with the NCAA, in August the organization announced it is considering sweeping reforms. Most would argue the reforms are long overdue. The biggest splash in recent NCAA investigations was its announcement of violations in the University of Miami’s athletic program — football players alleged to have accepted gifts, cash and prostitutes. This came on the heels of the NCAA taking final testimony from The Ohio State University (OSU) about its football scandal, which the governing body is expected to rule on next month. OSU grabbed headlines for broken rules, the lies and cover-up of its head football coach and how the university president responded. The revelations were less a public relations disaster than an indication that “integrity” and “character” seemed without a campus sponsor. The scandal unfolded by accident: the federal government notified OSU’s athletic department in December 2010 that its investigation into the drug dealings of the owner of a Columbus tattoo parlor also found football memorabilia from current football players. OSU then conducted an investigation and confirmed that several players had exchanged jerseys, rings, and other materials for cash and tattoos. Revered football coach Jim Tressel said he hadn’t known about this and the university reported the player violations to the NCAA. However a few weeks later, OSU discovered emails revealing that Tressel had lied. He had known about the violations eight months earlier and hadn’t reported it to the university or NCAA. He’d made false certifications to the NCAA, engaged in a cover-up and didn’t suspend the violators (who were some of the team’s best players) from playing in games. President Gordon Gee stood behind Tressel, whose winning record (106 wins to 22 losses) over the last decade had fueled alumni donations, lucrative TV contracts, and national visibility. Tressel had also built a reputation for how his religious faith shaped his coaching. Being caught in this kind of dilemma isn’t easy, but then Gee is no rookie. He has served as a college president for 31 years at five institutions including Brown, Vanderbilt and OSU twice. He has served also on several corporate boards. Gee admitted he discounted advice to fire Tressel saying he subscribes to a three bullet theory. He didn’t want to take one of the bullets for Tressel; the coach had friends among OSU’s trustees. In March when a sports reporter broke the story about the NCAA violations and Tressel’s cover-up, OSU held a press conference to respond. Tressel’s statement enumerated the hospital visits and other good deeds done by the football team. He said he hadn’t known who in the university to tell about the player violations because he’d been told the federal investigation (unrelated to OSU players) was confidential. He also didn’t apologize. Gee’s statement covered over Tressel’s lack of apology by saying he knew how much grief there was in Tressel’s heart. Saying Tressel had made a mistake, Gee praised him for chairing the library campaign, contributing to the medical center, visiting the troops in Iraq, contributing to hunger relief, having success on the football field and building the character and reputation of the university. He said he was proud to call the coach his friend. When asked if he planned to fire Tressel, Gee joked he hoped the coach wasn’t going to dismiss him. At the end of May, when Sports Illustrated let the university know they had information that the NCAA violations in Tressel’s tenure were more pervasive, Tressel announced his resignation (Gee’s support, and presumably that of trustees, having evaporated). In the wake of the scandal, the Trustee Audit and Compliance Committee recently undertook a university-wide review of all compliance policies . In January 2012, OSU expects to implement new standards for the university and new rules for crisis management as well. In the tsunami of OSU’s damage control efforts, the question is whether a best practice compliance program will impact tone at the top and if ethical violations will be seen as such and defended against. Or will those who deliver football or basketball glory continue to seem too big to fail?